online shopping are more and more “state of the art”… and why not? it is comfortable to buy your stuff by simply selecting the articles from a catalogue… best example: Amazon or eBay. It is also very easy to compare the prices and in combination with shipping methods like DHL Package stations you are not limited anymore to the usual opening hours of shops or post offices… this is a huge advantage if you are working. So services like Online shops and modern shipping methods eliminate limitations in terms of shopping, normally i can only buy the things i need during normal opening hours through my local shops nearby my flat. Online shopping eliminates this limitation. 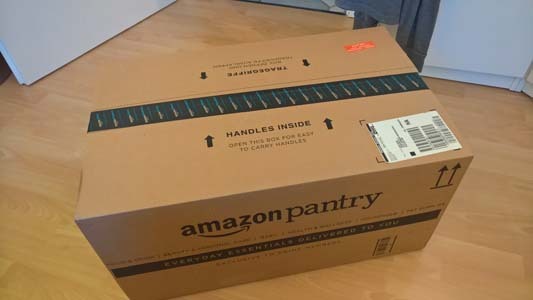 In the Amazon Pantry Shop every article are marked with details like weight and size and if you order something you at least have to order one “pantry box”, there is a limited amount of space available in this pantry box, so as more articles you select, as lees space will be available in your pantry box. One Pantry box and shipping will be 2,99 Euro. …this one was filled with round about 25 articels which is almost 80% of the whole amount of the box. The prices of the articels are almost on the same level like in my local supermarket and due to the fact, that i have to pay shipping costs for a pantry box, i dont see a big advantge of this online shopping service, the only advantage was already mentioned above.